So it was this past week, when shortly after the birth of our son, I was rocking him gently to sleep with one eye on a TV show about how Europe’s gothic cathedrals were built. Focusing on the massive limestone spires of the cathedrals of Notre-Dame d’Amiens, St. Pierre de Beauvais and Notre-Dame de Paris, this show was among the more interesting of its genre as not only did it deal directly with how modern architects are trying to prevent these houses of God from collapsing under their own weight, but it also brought back memories of our trip earlier this year to the Picardy region of northern France when we visited the first of these. While the nave of St. Pierre de Beauvais did in fact collapse because of architectural over-reach, which its foreshortened and incomplete appearance reflects, Notre-Dame d’Amiens stands perilously intact as among the largest of its kind in the world. Sitting on the highest point in town, it can be seen, as was intended, from miles around. At night, it is so illuminated by floodlights that the visitor might be forgiven for thinking it is heralding an alien invasion. When these giants of devotional architecture were being erected, they were in competition with one another for the title of the grandest monument in the country, but if competitive historic structural design isn’t your exactly bag, there is plenty else to appreciate about Amiens, including a feat of construction every bit as daring, but much more toothsome, than those stonemasons of yore managed. 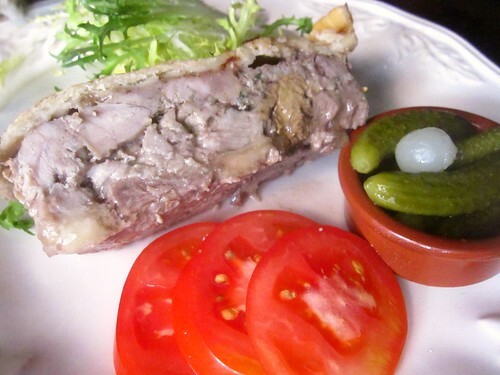 For Amiens, as Picardy in general, is famous for its duck products, and in particular for a fascinating multi-meat confection of duck, rabbit, pork and chicken livers all sealed-up crustily in a layer of savory pastry. In truth, this was my train of thought. Fatigued as I was by several sleepless nights and hungry for something corporeally rewarding, the enduring might of colossal 13th-century cathedrals was far less intriguing than Jane Grigson’s recipe for pâté en croûte d’Amiens. Moreover, I was even more drawn to it because its preparation seemed to be easy enough for my addled senses to follow. Even after butchering and stripping the duck and rabbit carcasses, it didn’t feel like a lot of work, nor did the very basic pastry recipe cause any pain, persuading me, momentarily, that perhaps this parenting lark isn’t so tough after all. However, pulling the rich, golden-brown terrine from the oven, and hearing my mother-in-law comment that in spite of the recent arrival of our firstborn I was willing to waste time preparing such a dish in place of a easy greasy take-away dinner, I snapped at her rather meanly, that given the level of the strain I was under, and some fried crap in a tray just wouldn’t cut it. I subsequently apologized, and had my nerves not been so frayed by weariness, I would have replied much more civilly, perhaps saying that in this pâté en croûte, I, like the structural engineers on the History Channel, had found a temporary solution to crushing gravity. Bone the duck and the rabbit, or have the butcher do it for you. Make the short crust pastry by sifting the flour and salt into a large mixing bowl and then rubbing the fat into it until crumbs fall. Heat the brandy in a saucepan and set alight (careful!) before pouring it over meat mixture. Add eggs, Madeira wine and half the warmed meat stock mixed with half the gelatin. You may put the meat mixture through a meat grinder at this point, but I left it chunky because I prefer it that way. (Optional) Line the terrine or baking dish with strips of pork fat and then pack in the rest of the meat. Add the pastry lid, brush well with a beaten egg and make one or two holes before baking in a 300F/150C oven for an hour and a half. 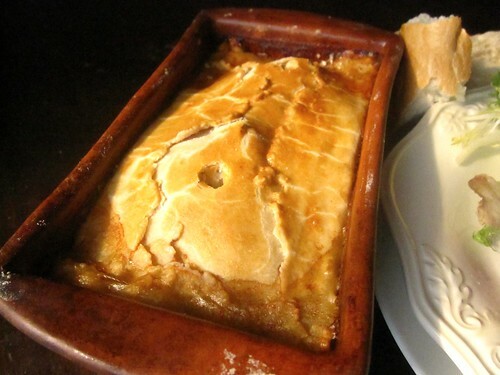 Allow pâté to cool completely before using a funnel inserted into the holes you made prior to baking to pour in the meat stock/gelatin mixture. Allow gelatin/aspic to set up for at least two hours before serving. Enjoy with crusty bread, cornichons, salad, and Dijon mustard, and wash down with red, white or pink wine, or even a sparkling cider from Normandy. The best time to prepare something is when you really feel like it… and did I know you had had a baby? Well, congrats! Hard to concentrate on the paté…I really wanted to know more about the newest addition to WANF. You must introduce him properly. I hope everyone is well and adjusting. P.S. Will you be pureeing offal for him? Where have I been? You had the baby already? Beautiful pate. I bought Stephane Renaud’s book on gorgeous pates, however, the skill level looks way to high for me. I will look at the photos and enjoy! While certainly your meal looks delicious, all I want to do is say: Congratulations on the baby! And maybe dance in a circle, but that might just be the effect of too much sugar and coffee today. @Miriam – we only just had him last Monday! @Joan – Thanks! We’re preparing him for primetime at the moment. Perhaps in a couple of weeks he’ll make an appearance next to tripe stew or something similarly suitable! @Stacey – Thanks! I don’t know about working fast, but our whole life is flashing before our eyes these days! This is the second terrine/pate I’ve ever made and it really was very easy, but it’s a few hours work squeezed between a couple of feedings! @Christine – thank also! Please feel free to dance away. After no sleep last night we need your energy and good vibes! Sublime! I think the galaxy of great goodies in the recipe would take my breath away. I would have to switch out the rabbit (a childhood pet thing) but whoa… the madeira and brandy with those wonderful meats must be… well enough to make sleepless nights more bearable. Congrats on the new addition… when does the babe get to try the pate??? I just wanna say _ I have met the lil addition and he is ADORABLE!! !–He will def be the best fed kid in the whole metropolitan area—OH and the Pate looks deelish!! @Deana – I understand the rabbit thing – I also had a pet bunny. It’s tough to get over. Baby gets the pate as soon as he sleeps through the night! We like to incentivize. @TS – thanks! It may be our last post for a while as serious sleep deprivation sets in. You are just a bit too secretive! I’m going over to this blog thinking, “I wonder if she had the kid yet,” and then seeing a food post and thinking, “Well, if she had the kid, wouldn’t there be some sort of announcement?” I keep reading and BAM you hit me in face with it. Well, you did the same thing when you made the teeennny little reference ot the “future child” so I guess I should have expect it. 😀 Congrats and may he bring you much joy and happy years to come. I think “multi-meat confection” is probably one of the most beautiful phrases in the English language. And Mom needs to chill. How many kids will suffer for years from parents who rely on takeout when things are tough. I say bring on the home-cooked meals! I love how you just sneak in the bit about your son being born! This actually gives me a lot of hope, I had thought that this type of dish would be unimaginable once parenting a small child had commenced. And, just WOW that anyone would criticize you for making something from scratch!! I was JUST TODAY reading that very same recipe. Uncanny, no? Only I didn’t make it. Oh, wow. oh, wow. Oh, WOW!! First — the baby. Then, this lovely en croute… you know how I love things en croute 🙂 And I’m so impressed that you managed to take the time for something of this magnitude in those first weeks. Seriously, though — many congrats. Kiss the little one for us — and enjoy every bit of these first few months. Nothing like it. So glad you popped into my blog. It meant I found yours lol Loving your style of writing and excellent parenting skills. 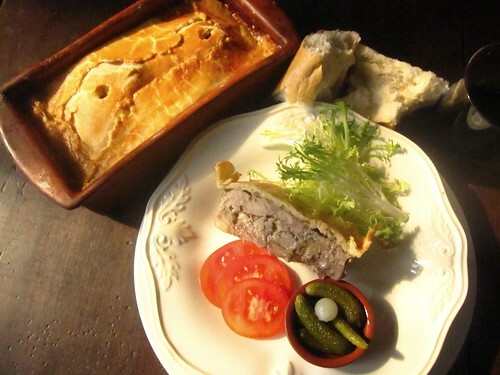 That pate looks to die for and I would love to try it! Wonderful insight into architecture too! I shall be coming back for more! Many congratulations, how exciting for you both! I too am impressed that you are knocking up such great food rather than greasy take-away, which is an easy option for times like these. Enjoy your baby, they grow up way too fast. I visited your website; Loving your style of writing. Your meal looks like delicious. Congrats!!! You work fast!